This is the first weekly installment of my look back at 1987’s Max Headroom series. The Story: TV viewers are mysteriously exploding, and Metrocops are covering up the evidence at the behest of Network 23’s skeevy CEO, Ned Grossberg. Crusading TV journalist Edison Carter and his new controller Theora Jones learn that their network’s “blipverts”–highly-compressed commercials that take up only a few seconds of airtime–cause fatal sensory overload in especially sedentary viewers. 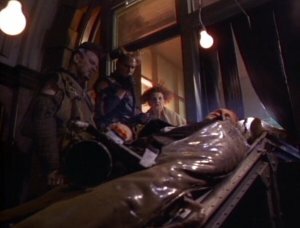 Edison is injured in a motorcycle accident, and Network 23’s resident whizkid Bryce Jones attempts to download the unconscious reporter’s memories. In the process, he accidentally creates Max Headroom, an artificial personality who lives inside the TV. 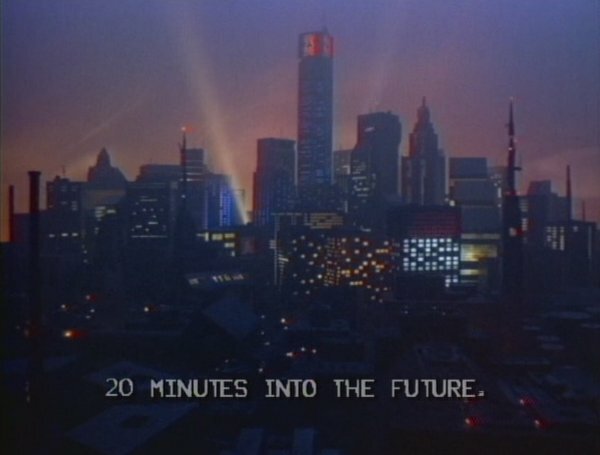 Behind the Screens: As I mentioned in my introductory post, the first episode of the American Max Headroom series was a remake of Channel 4’s TV movie, 20 Minutes into the Future. Yet there were a number of changes, both cosmetic and substantive. The main difference is that the secondary plot involving the pirate television station BigTime was dropped. (Some of that material reemerged later in the series.) In the British telefilm, ﻿Edison Carter never met his digital doppelganger. Instead, Bryce’s hired goons Breughel and Mahler took the computer containing Headroom to BigTime for safe keeping. The movie ended with Max happily chattering away as the pirate channel’s new deejay. “Blipverts” has him taking up residence in Network 23’s systems, flitting from screen to screen and even interrupting programming at will. Another change can be seen in the city itself. 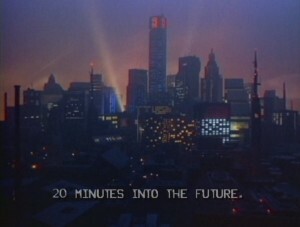 Originally, Network 23’s headquarters appeared to be the single skyscraper dominating its squalid surroundings. For the American version, there’s a much more elaborate cityscape. Then there’s boy genius Bryce Lynch. The character was conceived as an amoral creep who had body snatchers on speed dial. He was softened in the remake, the better to make him a series regular. Ned Grossberg, the evil network CEO, is played by Charles Rocket, best known for dropping a live F-bomb during the 1981 season of Saturday Night Live. He and his twitchy neck will show up again in season two when he becomes the head of a rival network. 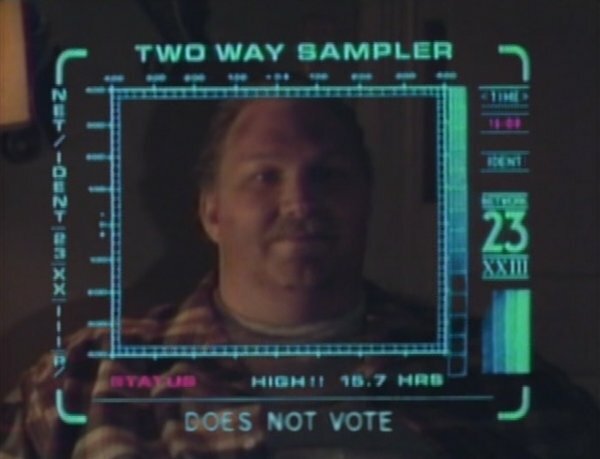 Arguably, the most important piece of future tech introduced in this episode is the “two-way sampler” through which the networks (and, presumably, anyone with the right access) directly watch their viewers. The sampler delivers real-time ratings and demographic information; note the “does not vote” in the screen capture. This allows the networks to modify their programming in instant reaction to audience trends. Most important for the purposes of this show, it’s what allows Max Headroom to interact with the rest of the cast. Preventing viewers from “channel surfing” continues to be an obsession of network executives. Ten second commercials aren’t uncommon. There have even been tongue-in-cheek attempts at “subliminal advertising,” some of which have resembled “blipverts.” To my knowledge, no couch potatoes have exploded. We don’t yet have the ability to watch you through your TV screen*, but ratings companies have developed “personal people meters” that allow them to determine which members of their sample audience are currently in the room. Computer technology has made great leaps since 1987. The Commodore boxes seen at Network 23 have long since entered our ground water. We might not be able to download a person’s memories, but if we could, we would certainly have enough buffer space to give our digital duplicates bodies beneath their shoulders.